I’m not going into details, I swear. But after about a year-long hiatus from the blog (yikes! I did make it out of Russia. Sorry to leave you hanging!) I’m back on the road again for my first work trip of the 2014/2015 winter season, and this time, with a little something brewing in the belly. 1. My ski clothes are definitely tighter. And I don’t know how much longer they can take it. I’ll need a new wardrobe or look of some kind soon. Don’t judge me if I default to full-on snow pants. 3. My brain might go foggy. If I forget your name, for instance, don’t take it personally. I thought it was a wives’ tale (haha, get it) that women lose their minds when they’re pregnant, and while I’m happy to announce I still have a decent amount of mine, I have blank moments. It could be the baby, or here in Houghton (on Michigan’s Upper Peninsula) my brain could be literally frozen. 4. Just when I thought it wasn’t possible, I’m an even slower skier this year. Ironic that I’m one of the faces of FasterSkier.com. Good thing my coworkers are in much better shape. 5. And I’m OK with all this. Getting big, huffing and puffing on the flats, being hungry 100 percent of the time, it’s all good! I’m excited for what the rest of the year brings, from this next week at U.S. Cross Country Nationals in Houghton (my first time here) to World Championships in Sweden followed by Biathlon World Champs in Finland, to the due date of my first kid on June 1. It’s going to be an interesting winter; I’ll share some of the funnier or more interesting stories about events or places along the way. Thanks for bearing with me! 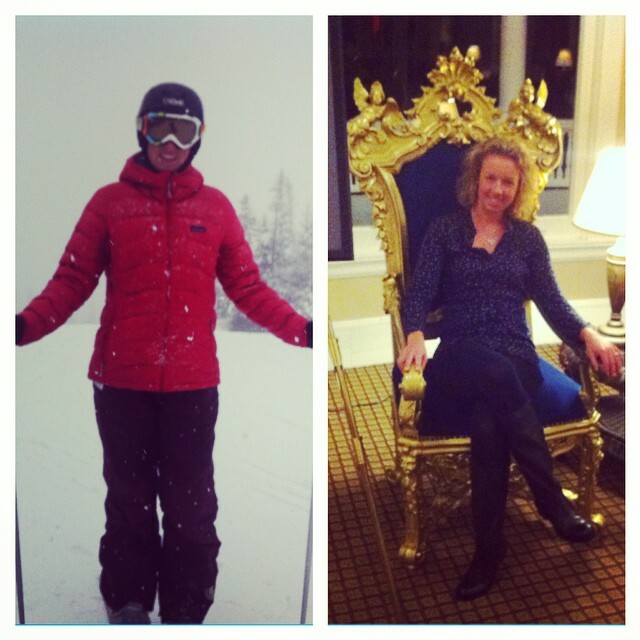 Skiing, then wining and dining (minus the wine) at Bretton Woods and the Mt. Washington Resort in New Hampshire in mid-December. You’re probably dying to know what Russia’s really like — I mean, it’s a big reason why I wanted to come here in the first place. But to be honest, two weeks into my Olympic journey, I can really only tell you about the Olympics, specifically the mountain cluster, and really, the nordic events — if you want insider details. The region of Krasnaya Polyana, and its villages of Gorki and Rosa Khutor, where I’ve been spending the last 13 days aren’t your salt-of-the-earth, local-yokel joints. Part of the reason is because they’re brand-new towns created for the Olympics. One of the first days I was here, I went for a spring-like stroll down one of the main pedestrian side streets in Gorki. I heard an American say it reminded him of Disney World — and to a point, I agreed. The buildings are bold and impressive, and opening each day to reveal new hotels, businesses, and shopping malls. You feel safe on these streets, with plenty of tourists and journalists buzzing around by day and bright lights and purple-coated security guards at every corner by night. 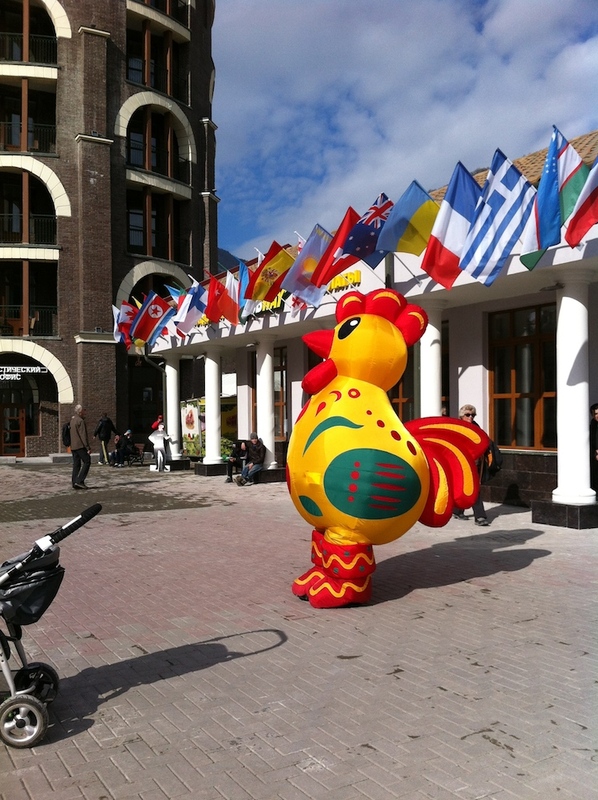 I was most nervous about an inflated-chicken mascot, who playfully pecked at unsuspecting people passing by. Most mornings, when the sun’s out, there’s a dance party in Gorki Square. Hello Kitty dances with Spiderman, the chicken bobbles around, and all the costumed characters toss a beach ball to one another while standing in a circle — and anyone else can join in. What a way to start your day. I have to applaud Russia in so many respects. The Olympic organizing committee’s volunteers are friendly and generally speak good English, their security guards are often jovial, and even the police officers in those ushanka trapper hats (yep, they wear them even when it’s 60 degrees out) occasionally smile. But my sense is this isn’t real Russia. This isn’t reality no matter what country you’re in. I’m living in an Olympic wonderland and sometimes I wonder if I’m falling into a false sense of security, or if I’m letting my guard down. As was swimming in my hotel’s five-day old lap pool this morning, I smelled something. Something like gas or diesel. I just kept swimming, swimming, until finally it got a little hard to bear. You’re being over-sensitive, I thought. I finished my swim and still smelled it. The windows were open, and I think it was simply some kind of inversion, where the fumes from the highway down below wafted up to our mountain hotel. But I really don’t know. Last night while I was in a deep sleep, Nat and Chelsea heard explosions around midnight. I’m assuming it was avalanche blasts from the several inches of snow we received yesterday. But who knows? Regardless, I didn’t find out until the next morning, and it hasn’t affected anything as far as I can tell. Our all-you-can-eat buffet breakfast was still out with even more options to chose from, and for the second day in a row, there was a bonus food-and-drink spread in the lobby. If nothing else, this country knows how to feed us in the a.m.
As I sit in the hotel lobby in a swanky chair sipping my second cup of coffee, along with a free seltzer water, I’ve got to tell you, I can’t complain. 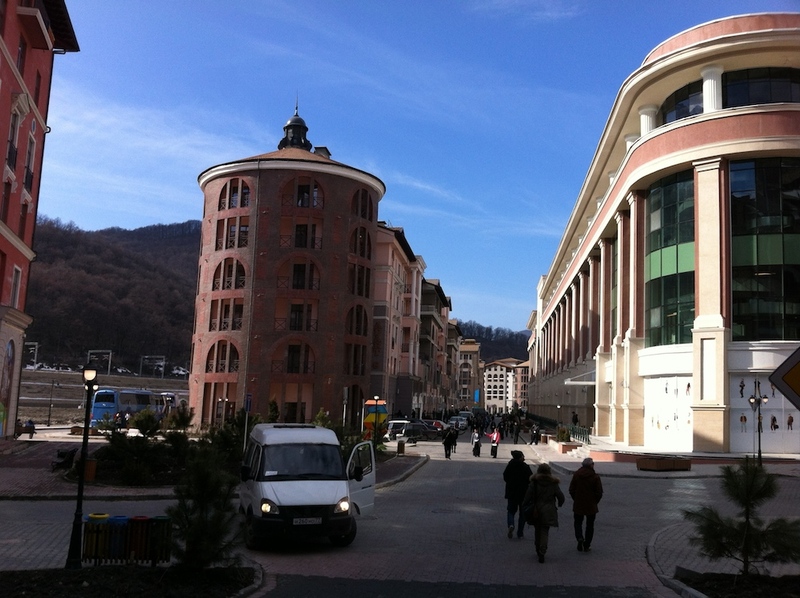 Tomorrow, we’re planning to head down to Adler, the coastal town near Sochi. Maybe after that, I can tell you more about Russia. But somehow, I don’t think I’m going to get the full effect. The Laura Cross-Country Ski Stadium on relay day. Our outdoor workspace when the media center became unbearably hot last week. View from the biathlon venue. The first “grocery” store I found in Gorki. A bigger one opened a couple days later. The most “Russian” thing I’ve experienced so far is Ukrainian borscht soup. Since beets aren’t my thing, it’s not my cup of tea. First snowstorm since we’ve been here on Monday. Was pouring rain at lower elevations, like Gorki and Rosa Khutor. A strangely Italian dining experience in Russia. No complaints! Chelsea and I at the women’s downhill today, where we witnessed a first-ever Olympic tie for gold in alpine skiing, a sport (like nordic) that’s timed to a hundredth of a second! I can’t believe it’s been a week since I touched down in Russia, hopped a Sochi 2014 bus and headed up into the hills of Krasnaya Polyana. Sorry to keep any of you anxiously awaiting my fate, but I’ve been able to post photos on Facebook, Instagram and the like. And it’s no excuse, but we literally hit the ground running and haven’t stopped. A typical day covering an Olympic event (or two or three) consists of sleeping six hours, waking up late morning, getting in some kind of movement (I hesitate to say “workout”), then eating as much of our hotel’s free breakfast spread as possible — which is supposed to hold us through the day. By the time we leave the hotel, way up high on a mountainside in a newly constructed village for mostly Olympic media lodging, it’s around 11 a.m. and we’ve got a race in two hours. It takes about an hour to get to the Laura Cross Country Skiing and Biathlon venues, and involves a 10-minute gondola (or “Karusel”) ride down from our little village — with two or three hotels fully operating out of a half dozen or more. We were some of the lucky ones; ours was ready upon my arrival late last Thursday night. The spa, including a pool and gym, were finished yesterday. At the bottom of the gondola, Nat, Chelsea and I walk up the street and cross a bus-ridden, multi-lane road to start heading toward the venue. It’s a walk that gets more pleasant as you go along, and usually isn’t an issue with traffic in broad daylight. The buses don’t want to hit you, but they’ll honk if you run right in front of them. There’s no need to play frogger in Russia. Anyway, with some strategic J-walking (sidewalks are a little sporadic here), we make our way along the river that’s been rerouted in several different directions around the valley. It’s all part of Sochi’s $50+ billion dollar Olympic budget, and while it’s impressive they can move rivers, one can’t help but wonder what’s going to happen when the snow melts off the mountains this spring, or next spring, or in a couple years from now. Hopefully all of the infrastructure and these villages built up for the Olympics hold up. Hopefully people come back and visit them as winter destinations. With no need for a jacket in temperatures near 60 degrees, we walk 5-10 more minutes to the gondola. There, we’ve got a security checkpoint, complete with a rotating belt to put all of our personal items on and security personnel who make me take my food out of my bag every time I pass through. I always agree, explaining the sunscreen is for my face and letting them scan my water bottle with whatever the heck is supposed to detect it’s not vodka. I’m not sure it would be a big deal if it was. Once through, we board the next gondola, which takes about 15 minutes to get to the top. At this point, we’ve usually joined some other international journalists or photographers, and sometimes we start up conversations. Other times, nobody wants to speak English, or they just want to hear us talk about nonsense. From there, we’ve got a short shuttle ride to the biathlon venue, where the print media center for the two locations is located. This is where we can work for an hour or so before the race and then, usually around 2 p.m., it’s go time. I won’t bore you with the details of the races, but if you care, check out FasterSkier.com. We’ve been working our tushes off covering cross-country and biathlon races each day, and I couldn’t ask for two better co-workers to handle the workload with. 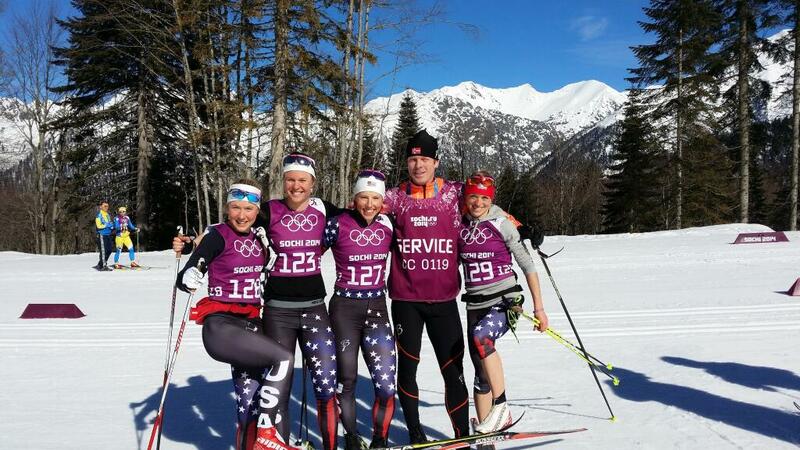 Every day has been fun, and so far, historic for the U.S. nordic and women’s biathlon teams. It’s a good trend that I hope continues — it makes our jobs more rewarding and I’m sure it’ll make the whole experience more memorable. Two days ago, we had a bit of a curveball in the women’s cross-country sprint. American Kikkan Randall had been the favorite in the skate sprint, right up there with Norwegian great Marit Bjørgen, and she was expected to end a 38-year Olympic medal drought for U.S. nordic skiing with the first medal since Bill Koch’s silver. On a perfect day, she could win gold. That didn’t happen. It didn’t even come close. Randall qualified in 18th out of the top 30 that get continue racing in the quarterfinals. She led most of her quarterfinal, which was stacked with two other medal contenders in Bjørgen and Germany’s Denise Herrmann, but lost steam down the stretch toward the finish. Herrmann and Bjørgen whipped by her to place first and second, and an Italian came from behind to beat Randall as well. Fourth wasn’t enough to lift Randall to the next round. She had been eliminated in a skate sprint quarterfinal for the first time in three years — the last time being at 2011 World Championships. The reality of the situation hit me with a sinking feeling, something I’ve rarely, if ever, felt as a journalist regarding the outcome of an athlete’s performance. But Randall is especially unique, an athlete who’s led her sport to unprecedented success in her nation and really never faltered — at least not recently — along the way. She’s an iron woman who’s also human. And that showed Tuesday. 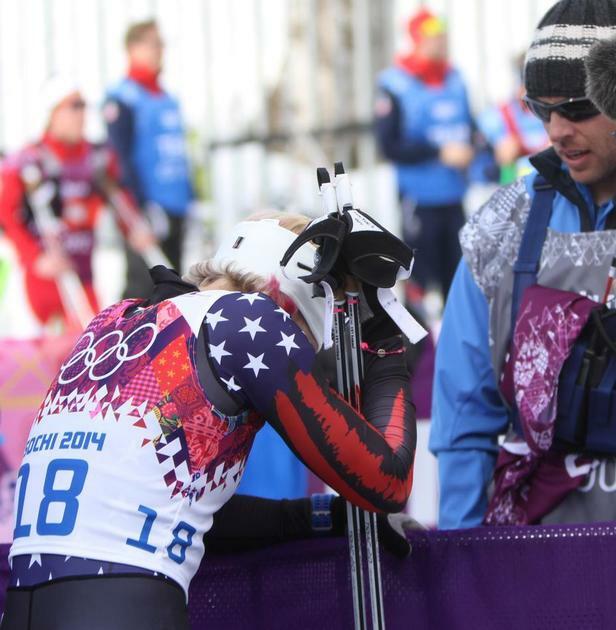 Kikkan Randall with her husband after being eliminated early in Tuesday’s freestyle sprint at the 2014 Olympics. As Randall walked slowly down the stairs out of the broadcast zone into the print area, she stopped for a moment. Sheltered behind the U.S. Ski Team’s media attache, Margo Christiansen, Randall let it all out — or whatever she needed to get out at the time — then wiped her eyes a minute or two later and got back to answering questions. For the first one, she walked right over to me. Reporters from major news outlets like ESPN, Sports Illustrated, and several others swarmed around to get a piece of the interview and questions in edgewise. But for the next couple of minutes, Randall answered my questions. She spoke about emotions, tactics and initial reactions, plus her ever-successful team. It was a nice acknowledgement to the work we’ve put in over the years, in which we’ve extensively followed and written about Kikkan and the U.S. and Canadian ski teams on the international-racing circuit. But at the end of the day, her Olympic dream was lost, and we had to write a story about it. Meanwhile, another American, Sophie Caldwell of Peru, Vt., achieved the best-ever U.S. women’s Olympic finish of sixth in the same race. It was the silver lining and an incredible surprise for Caldwell, who graduated from Dartmouth College fewer than two years ago. We wrote about that one, too, along with the women’s biathlon pursuit, which started at 7 p.m. that night. Getting back to our hotel around midnight, we decompressed on leather sofas in the cushy lobby. There was still work to be done, which carried into the next day and the next, and I nodded off at the usual 3:30 a.m.
It’s 2:30 a.m. tonight and I’m psyched to go to bed a whole hour earlier, if I can get to sleep. After grabbing some dinner at an Irish bar in the town just north of us (complete with Russian waitresses in kilts and $10-dollar Guinesses), we rode up the gondola with a Canadian couple. Not knowing who they were, we asked the usual: why they were there, who they were supporting, where they’re from. 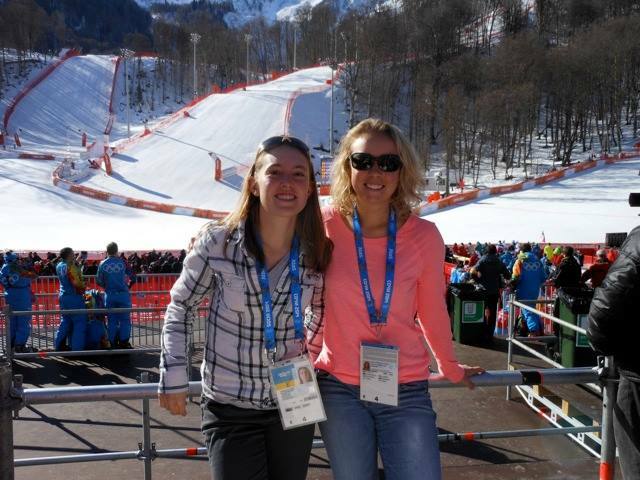 They had just come from the women’s luge competition, where their daughter Alex Gough was competing. We asked how she did. She lost out on bronze to an American that hadn’t beat her all year, they said. And she’d been on the podium for essentially every event leading up to the Olympics. Now that’s tough to swallow. So whether you’re 18th, like Randall, or fourth in an event you were favored in, the fact is the Olympics are the Olympics. It’s hard to put a perfect performance together on a given day, and that’s what makes this pinnacle of many sports so fun to watch. The stars have to align, and when they don’t, you have to pick yourself up and try again. This is why I love sportswriting, and this is why I came to Russia — for a little more perspective on life and the most incredible athletes in the world, and how they’ve become great at what they do. I guess the best way to jump right in is to make the point that everyone who’s traveled even a little bit has a war story. That’s why I’m not scared. Yes, the Olympics, which start in less than two weeks in Sochi, Russia, about 500 miles from the volatile region known as Chechnya, present new fears — fears that are infiltrating our news and validated every time a terrorist strikes anywhere near Sochi. People are concerned and I don’t blame them. 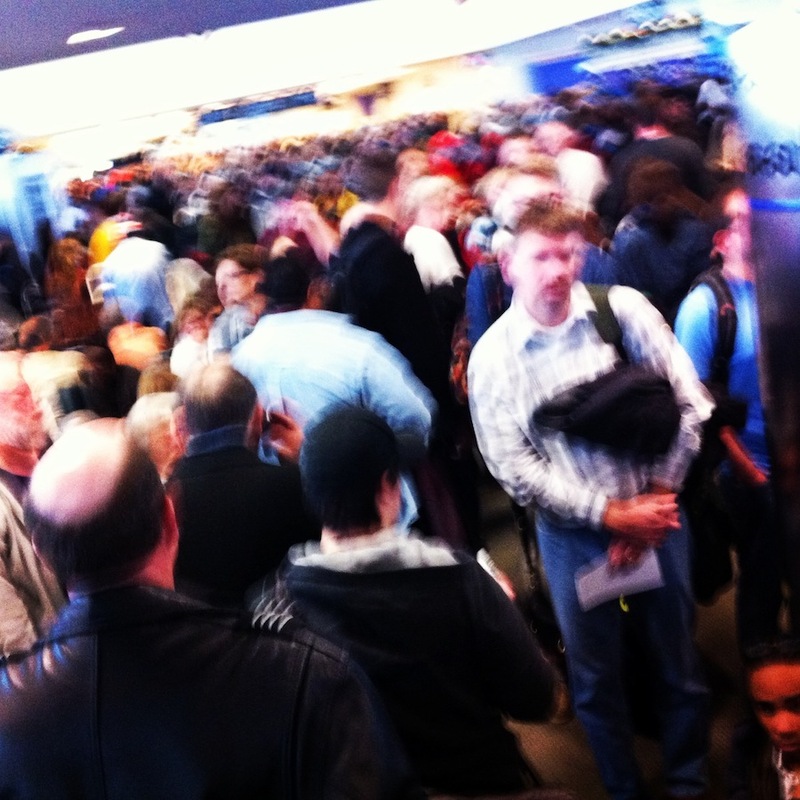 Chicago’s Midway International Airport on Jan. 2, 2014. My home sweet home for the next 24 hours. But back to the travel stories. Two days after New Year’s, Chicago was a hub of airport mayhem and tens of thousands of unhappy passengers — customers, really — all trying to get to their final destination. I stood inside one of Midway’s terminals for 24 hours trying to figure out how to get the heck out. It was Friday and I heard murmurs about how there was no way anyone was getting to Salt Lake (my final stop) until at least Monday. Succumb to hotel life for the next three days? Not an option. Everything was booked solid in the windy and snow-impacted city. Fear never crossed my mind (why would it? ), nor thoughts of what if I never get out, although a couple I befriended jokingly entertained that possibility. It wasn’t funny but it wasn’t scary either. I got out of Midway by staying alert and being somewhat savvy. I made sure I hustled, stayed on top of my game, and didn’t let the situation take control of me. While Russia and the Olympics are an entirely different ballgame, I’m approaching it similarly. Fact is, you can’t prepare for the unexpected. At least that’s how I feel. You can, however, be as alert and savvy as possible, stay on top of real threats and warnings, and seek out the safest environments in a given place. But I won’t stay home or let opportunities pass me by out of fear alone. It simply isn’t worth the risk to me of not going to the Olympics, of not experiencing a once-in-four-years Winter Games, which will be my first. Up at dawn to watch the flag ceremony in Tiananmen Square, just outside the gates of the Forbidden City before the 2008 Summer Olympics in Beijing, China. Six years ago, I went to China. For two months. As a student. 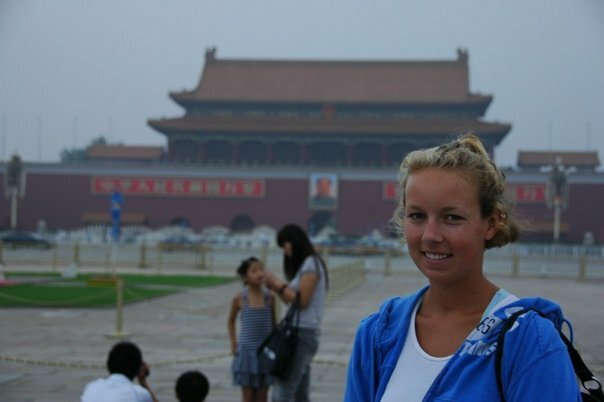 I interned for the Olympic News Service at the 2008 Summer Games and ran around greater Beijing with little international travel experience and learned a lot in a hurry. Russia will be different than China, no doubt, but one thing I took away from there was to not be scared of feeling uneasy. Instinct is our most basic and often most reliable form of security. Stay in tune with exactly how you feel in a situation and try to figure out what’s behind those feelings, whether those nerves are justified or not. You won’t always know what’s ahead — but when does anyone, ever? Above all the stresses that surround travel, there’s the underlying reason some of us love it. New experiences. That’s why China and its Olympics left me wanting more; that’s why I’m going to Sochi. I wrote this blog post in my head while hiking in Lake Placid, N.Y. Thirty-four years after this region last hosted the Winter Olympics, that spirit is still going strong in this little touristy-yet-twinkling village. That’s the kind of spirit I can’t wait to experience again, and that’s the spirit I hope will outweigh, overshadow and defend against any kind of radical acts in Sochi. 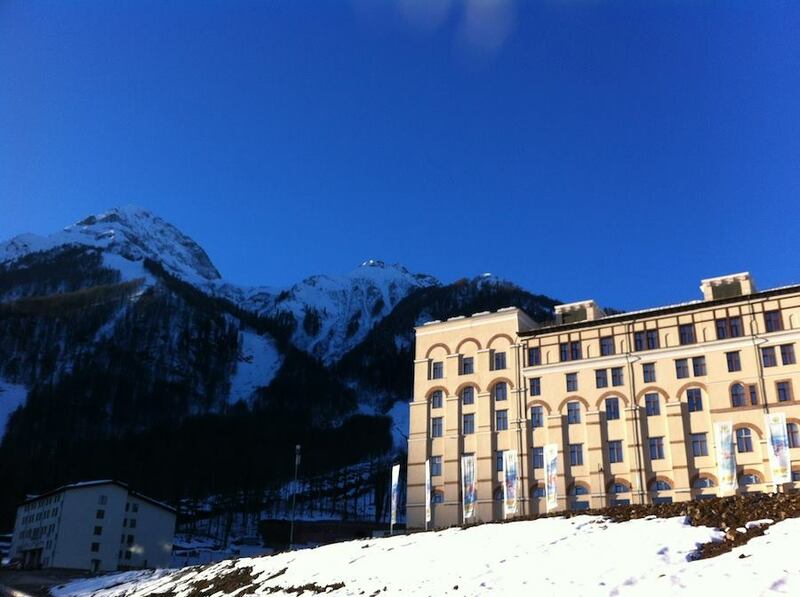 Alex is heading to Sochi with two coworkers to report on the 2014 Winter Olympics from Feb. 7-23. 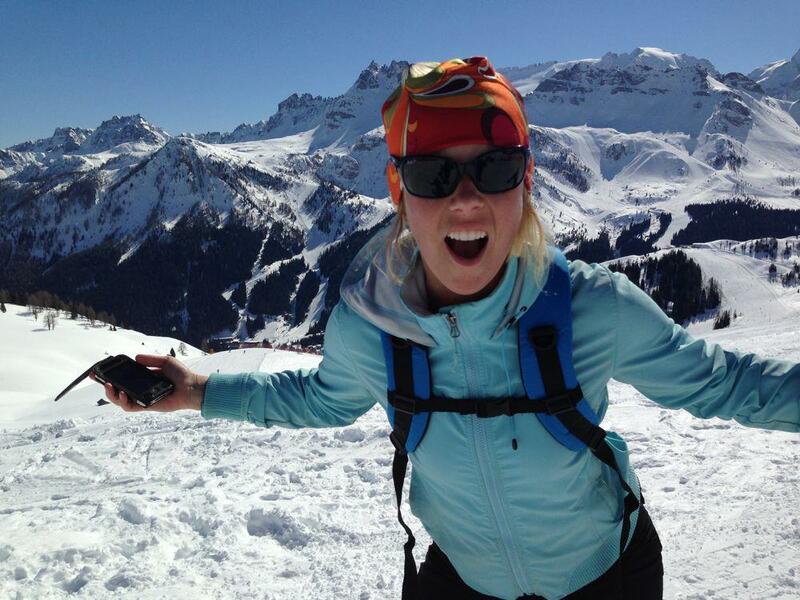 Check out their stories on FasterSkier.com and follow her on Twitter @Active_Alex. It’s been a while, I know. Rather than rehash my entire winter and why I didn’t blog from March until now, I’ll get to the point about what’s been up. I had an amazing winter in my first year with FasterSkier. I went to an incredibly diverse set of places, including British Columbia, Quebec, Wisconsin and Park City. I caught some fresh tracks and sunburns, met nice people, made new friends and interviewed some of the world’s best athletes. I need to write about some of my experiences later in the season (including a week in Craftsbury, Vt), so stay turned to my FasterSkier blog for that. 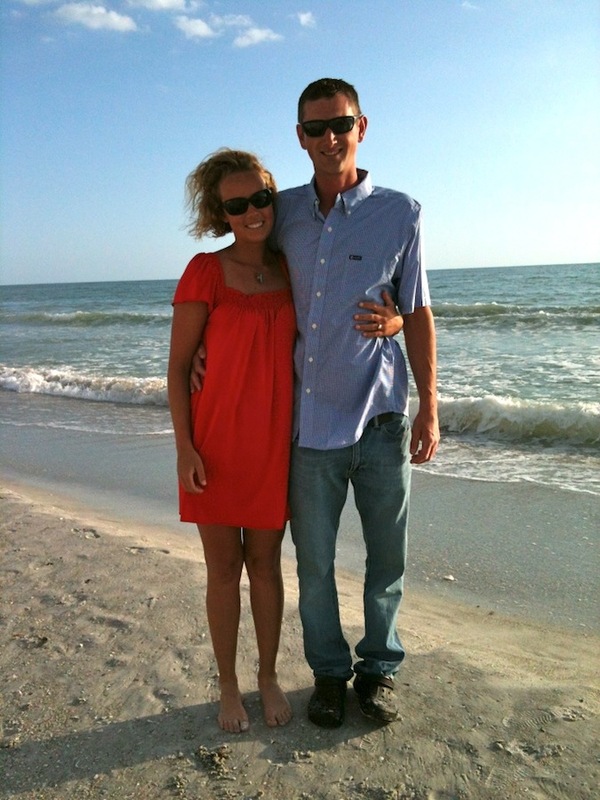 On the home front, I got engaged nearly the second I came home — Brian surprised me in early April while we were on vacation in Florida. The wedding’s planned for next September so that gives a stress-case like me some time to relax. I’m still full time with FasterSkier in the summer, but this job rocks — to give it that ’80s enthusiasm. I work from home and generally on a self-driven schedule. If I get the work done, I can go out and play. I’ve been trying to improve my time management and productiveness, and the summer’s already shaping up to be a fun one. Yesterday, I participated, err, competed in my first triathlon of the season. 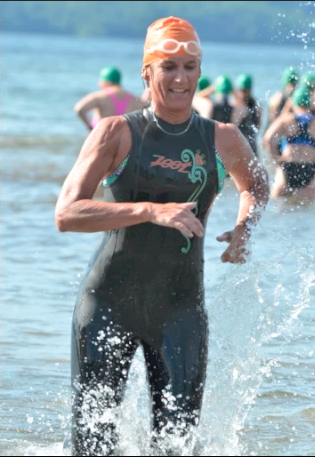 I’m hesitant to say which I did at the North Country Triathlon in Hague, N.Y., whether I took part or really raced, because it was a mix of both. For starters, my mom and I teamed up in the Olympic-distance race: she did the 1-mile swim, and I did the 25-mile bike and 6-mile run. That was our team name and we came in 11th of about 20 teams. Not bad considering we were nearly dead last of the relays last year. My biking improved — I would say I raced that part. It’s a challenging course with about a three-mile climb that’s the toughest I’ve ever done. But it went better this year. I ended up averaging nearly 16 mph over the entire course, up from around 13 last year. My mom, Wendy, did outstanding. Pretty sure she was the sixth woman out of the water and fourth of all the relays — which are coed. I was in decent position for a top-10 finish after the bike, but things fell apart in the run. It wasn’t the worst I’ve ever experienced, but around the turnaround point at 3.1 miles, I was toast. My body started to shiver in the 85-degree heat, my fingers swelled so much they hurt and my stomach turned upside down with each step. I had to walk several times on the way back because I was struggling to keep it together. About a quarter mile from the finish, I saw my mom, dad, cousin and parent’s dog, Archie, smiling and cheering. That got me to the finish. And that was the day. I went for it in the bike and suffered in the run. I need to learn how to hurt more, how to keep my head straight and body moving when I feel that bad, but I have no regrets. It was a great experience with family, a beautiful day on Lake George and a good way to start summer. I’m not sure how many triathlons I’ll do this year, but my mom and I already decided to each do the entire race — all three legs — next year. Something to look forward to, for sure. This summer, I’m excited for a few events. After surviving the Spartan Beast race last year, my brother and I signed up for another obstacle-course trail run — this time a 10- to 12-mile Tough Mudder at Mount Snow, Vt. The race is July 15, so the countdown begins now! We’re raising money for The Wounded Warrior Project in the process, so please consider donating to this important cause. Two days after that, my father and I are doing our somewhat annual hike-to-the-huts trip in the White Mountains of New Hampshire. We try to go somewhere different in the AMC’s trail system every year. After that, I’ll keep trail running in preparation for the Jay Peak 50 k in September. (I did my first trail half marathon in Paul Smiths last month, which went well, otherwise I wouldn’t have signed up for anything longer!) I’ve written before about the importance of goals, especially in training. I don’t always follow my own preachings, but this summer, I’m making a point to. 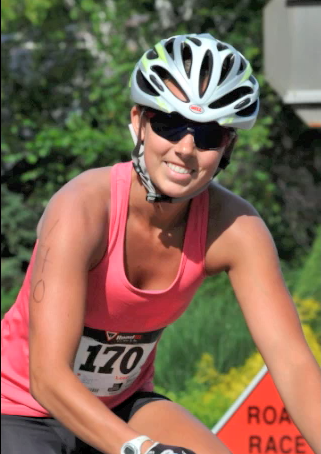 I’d like to get back on the running wagon after having too much fun (and workouts spent) on the bike. Trails are a great place to lose your mind and get in some jog time. Sometimes, I just feel happier in the woods. You forget you’re running, you forget your to-do list (or figure out how to tackle it later), and occasionally you get lost. Or at least I do. That’s why I’m going to leave you with an important message from experience: if you’re going to go to an unfamiliar trail system, or one you’re not 100-percent comfortable with, bring a trail map. Many are online so just print it out, fold it up and stick it in your shorts. Especially in places like Moreau State Park with intersections marked by a letter (usually S) and a number (1-17), it’s good to know where you are and how to get out. Oh, and bring water. My dog peed in a brook today; I’d hate for you to be downstream of that. Want a taste for what the American Birkebeiner, the largest cross-country ski race in North America, is like? Take a look at my video and blog post on FasterSkier. 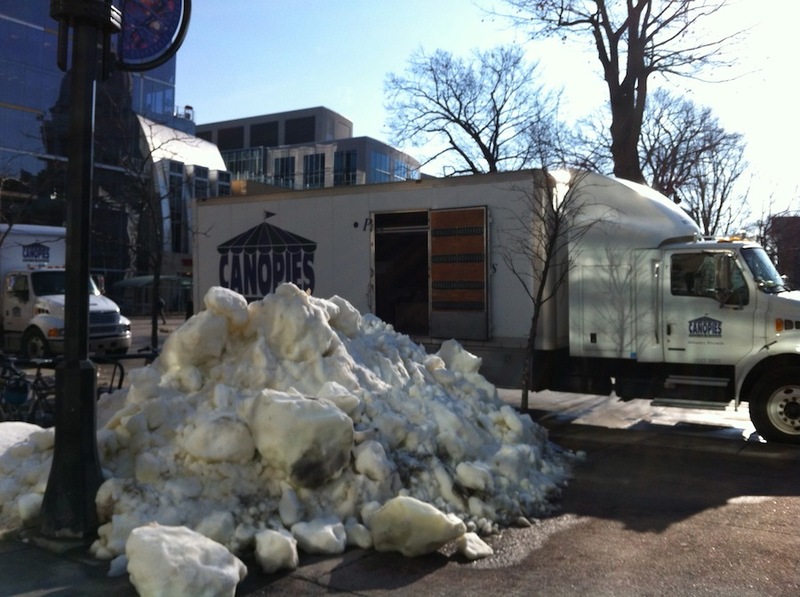 A little pile of trucked-in snow in the heart of Madison, Wis., on Friday, Feb. 17. Capitol Square is hosting the Madison Winter Festival on Saturday and Sunday. So I’m back on the road for another FasterSkier stint. This time it’s all about the Midwest as I flew to Minneapolis on Thursday, am in Madison today and will be covering cross-country skiing races here this weekend. Then it’s up to Hayward, Wis., to write about the biggest nordic ski race in the U.S., the American Birkebeiner. If you know nothing about the Birkie, it doesn’t really matter. I’ll explain what’s worth explaining to those with no real interest in ski marathons later. Right now, I’m getting through an afternoon in Madison. It’s not that I’m not enjoying the Midwest. It’s great here. Had a little blip in the trip today when I drove four-plus hours from Minneapolis (after waking up at 7 a.m.) to figure out there’s no way I can write a preview for the weekend this afternoon. There’s no snow in Capitol Square, where they’re supposed to hold the races, no one to answer questions and so I have to kill time until 6 p.m. when the magic happens (and they dump truckloads of manmade snow onto the streets, I’m assuming). If you know anything about me, you know I don’t like the unexpected. I thought I’d find race organizers and maybe a ski racer or two in downtown Madison, where the SuperTour sprint races start at 9 a.m. Saturday, yet I found nothing but protesters and regular-looking streets. I went to the Madison Winter Fest website and it told me to go to the historical museum on capitol square. The guy at the info booth knew nothing, and one of the gift shop girls said she thought the whole weekend might be canceled because of the unusually warm weather. Yikes. 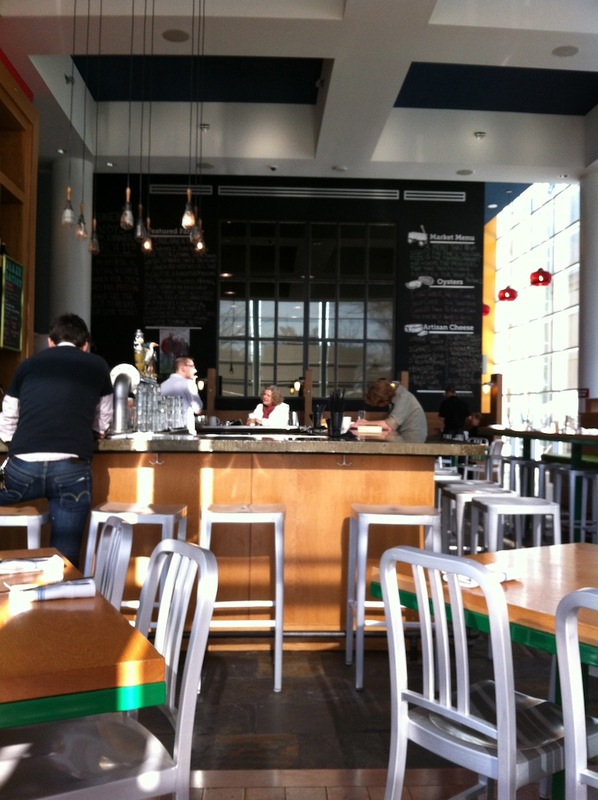 Inside "Graze" in Madison, Wis. I took a breather and went outside. I called the race organizer and he confirmed that they were putting snow down Friday night. There wasn’t much I could do from noon until then. So I went for a run. Two and a half hours after I embarked on my tour of the city by foot, I’ve cooled down. I know how I get: tired, rundown, cranky, overwhelmed. But that’s part of the game that I love. Travel is in my blood, and this is what you have to deal with. No big deal; I’m now sitting at an AMAZING lunch/dinner spot called Graze on Capitol Square. I’ve downed a beer after a 45-minute run and am eating lunch at 3:30 in the afternoon. I’m staying with a host family tonight so at least they don’t need to feed me. The restaurant has Wi-Fi, tons of windows overlooking the capitol building and good food. This will be my go-to restaurant for the weekend. They forgot me at first (ouch, I know), then felt so bad that they gave me some complimentary coffee cake. Madison is so cute. I’ll let you know how my time here progresses. Please check out my FasterSkier blog for more ski-related updates and to hear about my fun stay in Minneapolis. 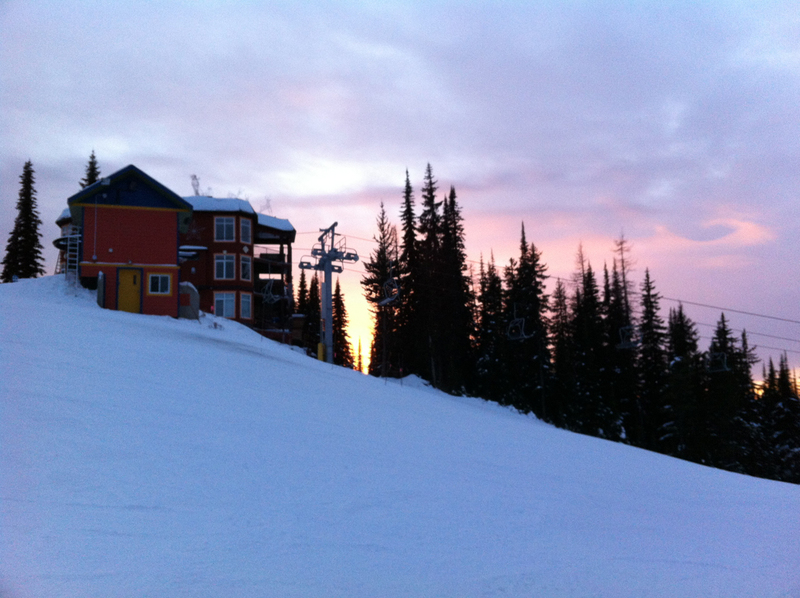 After nearly six months at FasterSkier, I’ve started my own blog there. 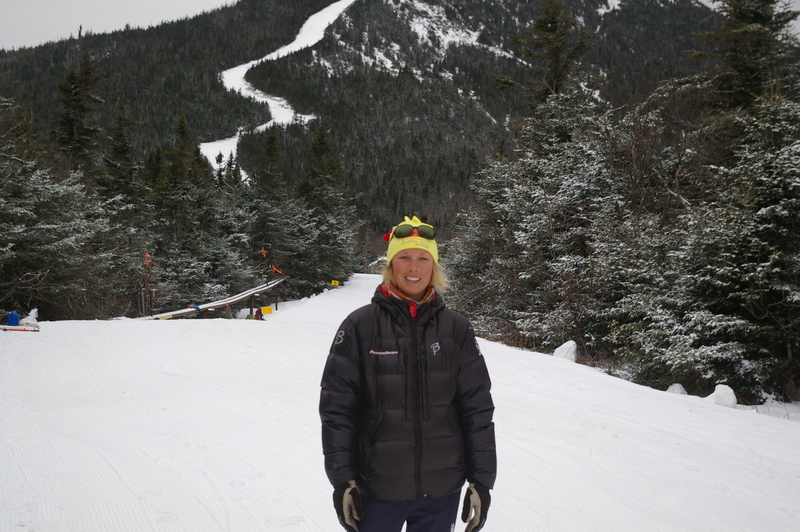 While I’ll continue to update this one with less ski-specific stuff, here’s an intro to what I’ve been doing on the job — and what Rumford, Maine, is like. I don’t know what I’ve done to deserve the experiences I’ve had, but I’m grateful. Now that the sentimentality’s out of the way, let me bring you up to speed on what amazing adventures I’ve had in the last few days. It would make sense to do things in chronological order, but for the sake of grabbing your attention, let me tell you about what I did Thursday. 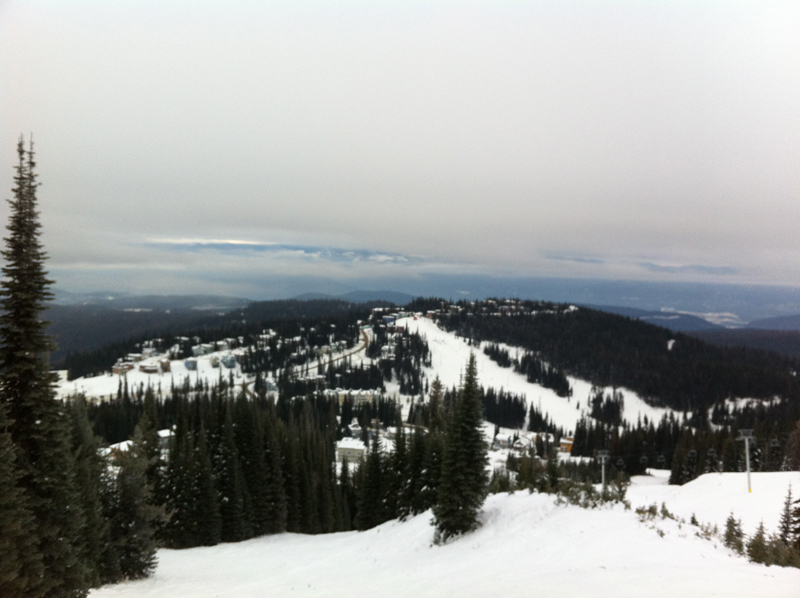 For my last morning in Silver Star, British Columbia, I’d planned to do a long ski. I had yet to connect the two nordic areas — Silver Star and Sovereign Lake — and I figured I could wake up early and manage the 2-hour loop. A few things got in the way. For one, considering this is a working vacation, I had to do some work. By the time I wrapped up and stepped out on my — yep — balcony, I realized skiing any kind of long loop in time to check out would be tough. 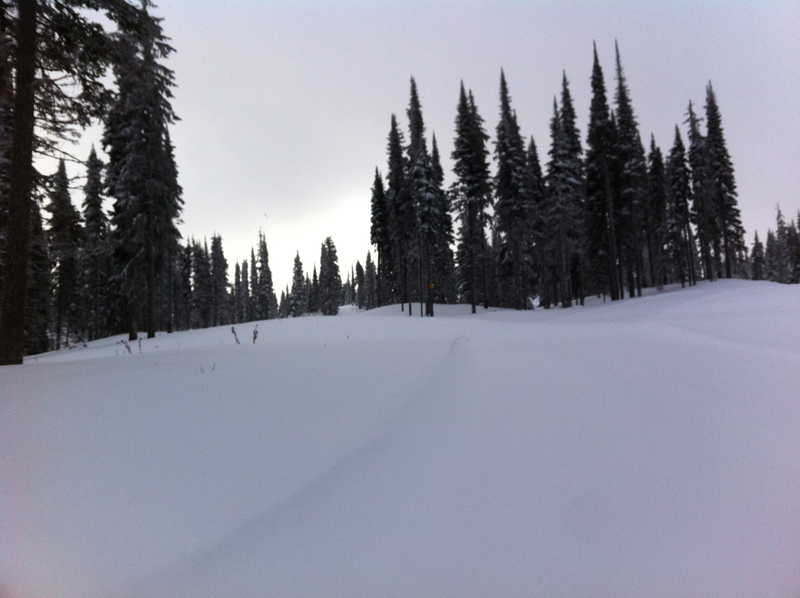 For the first time in several weeks, Silver Star had a powder day. It was still snowing by the time I clicked into the only skis I brought, the good ol’ Madshus skate. And so I trekked out in four inches of snow, uphill of course, since I had to try that loop around the ski mountain. That loop started out on an easy green, which was straight up an ungroomed alpine traverse trail. Thirty minutes later, I found myself at the T-bar, which runs to the summit. I thought about it, but decided to skate on — stopping every few strides and every single hill to catch my breath at nearly 6,000 feet above sea level. At 9 a.m., few downhillers were out enjoying the powder, and as my tracks proved, I was the only one doing nordic. I knew the further out I ventured, the less chance of grooming there would be, yet for some reason I refused to turn around. I had glanced at the trail map before heading out and decided I wanted to see the summit. A day earlier, the chairlift brought me there on a pair of rented alpine skis. But now, I wanted to conquer this mountain on my own two feet. I didn’t realize the amount of strength it would take me to get up there. With the clock ticking faster and faster, I realized I was covering less ground. My heartrate was out of control, my face beat red, and yet I refused to turn around (if you know anything about me, this is a common thread). 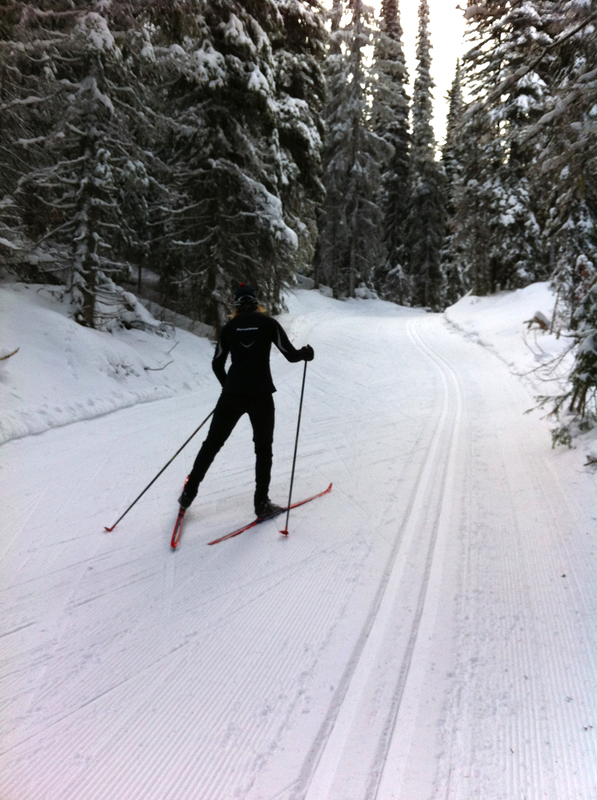 Finally, one cross-country skier came zooming down the trail — an older man, Scandinavian or something. “You’re getting quite a workout,” he said, looking at me like I was some kind of idiot for doing the route this way, in these conditions, on skate skis. 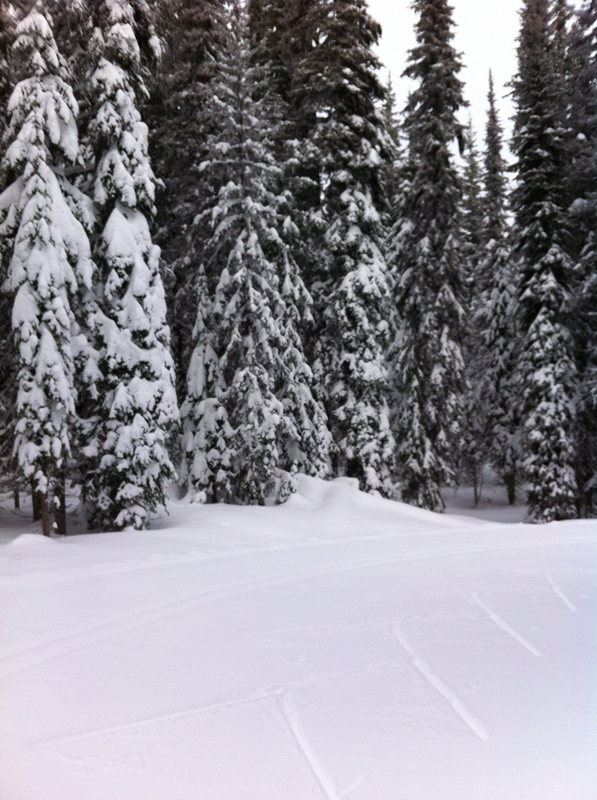 A blue nordic trail at Silver Star. Not recommended, especially in powder. Scanning his tracks for an indication of some kind of break for me, I was slightly disappointed when I saw that they never broke from their parallel path. It wasn’t all that surprising, though, considering where I was headed. About an hour and 15 minutes after I started, I made it to the top of Silver Star Mountain at 6,280 feet. 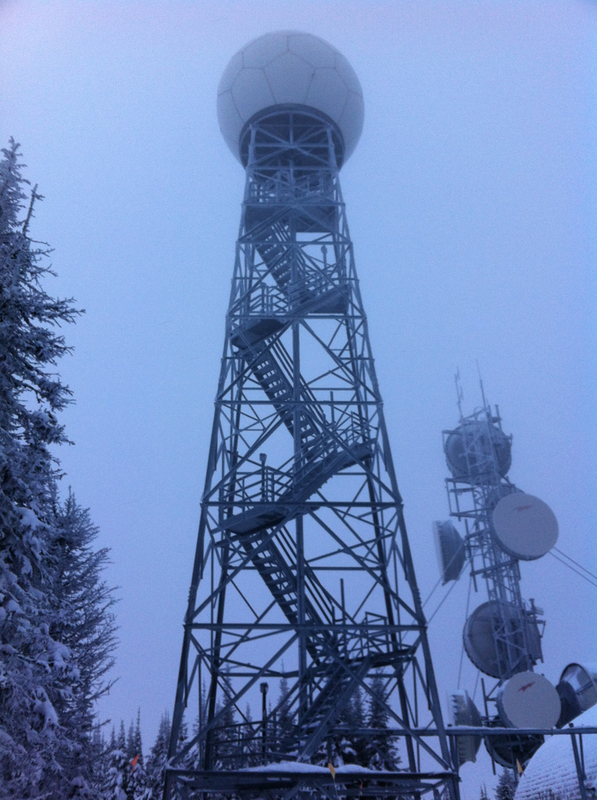 I snapped a quick photo of a tower to prove I was there (and the chairlift) and headed down. No time for nordic, I was going down the alpine side. A bit tentative to begin with, I tucked in my shirt and hoped for the best. Despite heading down a green trail, it was pretty challenging carving on edgeless skinny skis. My thighs burned from several necessary snowplows, yet I only wiped out once. A ski instructor looked at me as I narrowly avoided skiing off into the glades. I can only imagine what she was thinking. Within five minutes of reaching the summit, I was back to my home base and skied right up to my hotel. Breathing a sigh of relief for surviving in without eyewear in my thin tights and little nordic hat, I packed the skis away into the rental car. Now I had done it all — or as least as much as I could fit in. The day before on Wednesday, I spent the morning and early afternoon alpine skiing, then joined a master’s program at Sovereign Lake Nordic Centre. A 25-year-old in a master’s program? Hey, don’t knock it until you try it, especially when there’s an Olympian giving you pointers. The head club coach at Sovereign Lake, Darren Derochie, who competed for Canada in the 1992 Winter Games, led the program — which started at 6:30 p.m. under the lights at the nordic center’s stadium. This Wednesday was double-pole night. Perfect, I thought. Let’s work those triceps. The Sovereign Lake staff graciously lent me some classic gear and I joined the group of about 20 adults of ranging abilities and goals. Derochie and two other Sovereign Lake coaches divided the group by interests — if you wanted to work on stride, go here. New to double pole? Here. And experienced and craving a double-pole workout/tuneup? Come with Darren. I floated among the groups, taking photos and videos and making mental notes about technique. I needed some work on my DP as well, and Derochie was eager to give it. For a session I had been up-in-the-air about attending, I was happy I joined Derochie and his master’s crew on the 20-degree evening. When I got cold, I double poled more, training the body and refreshing my memory on how to ski. Without a coach since high school, it helped. How did I hear about this once-in-a-lifetime chance to ski with and get tips from an Olympian? Julie Melanson, Sovereign Lake’s communication director. 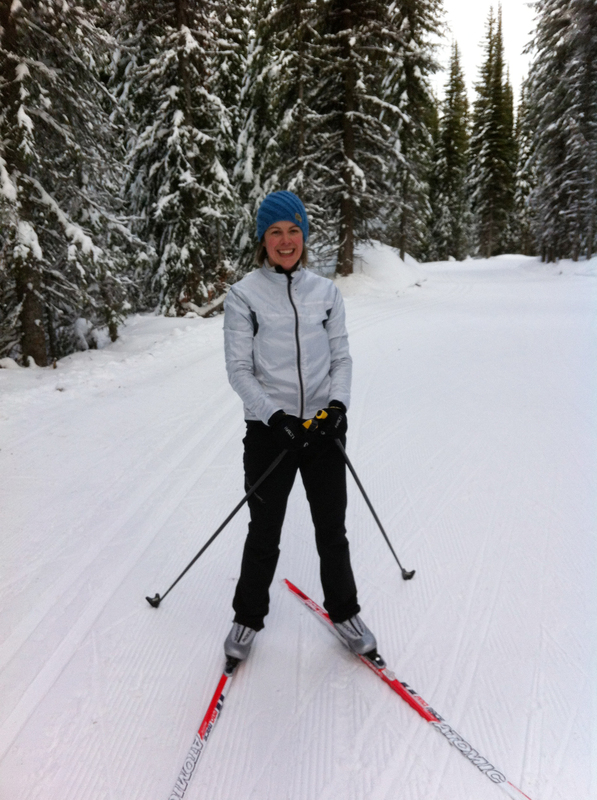 A professional mountain bike racer as well, she took me out for a recreational ski at Sovereign Lake on Tuesday. After venturing on the trails at Silver Star on my own on Monday (where it took me 10-minutes to go up one hill), I warned her to go easy on me at Sovereign Lake. She did, helping me snap photos for FasterSkier along the way. We started on green, progressed to blue and ended with a short black — a perfect variety in about an hour or so of skiing. I tried to shoot some video, but the phone kept freezing up. Julie said it was colder there than usual. “We have a minus-10 rule,” she said. That’s not negative 10-degrees Fahrenheit, but rather Celsius. Locals in Silver Star and Vernon don’t ski when it’s below 14 degrees Fahrenheit, she said. Why would you when the weather almost always around 30 degrees? As I packed up to leave Silver Star, I felt a little pang of nostalgia, and I hadn’t even left yet. I’d be back, I resolved. There was more to ski, more powder to crush and more incredibly friendly locals to meet. 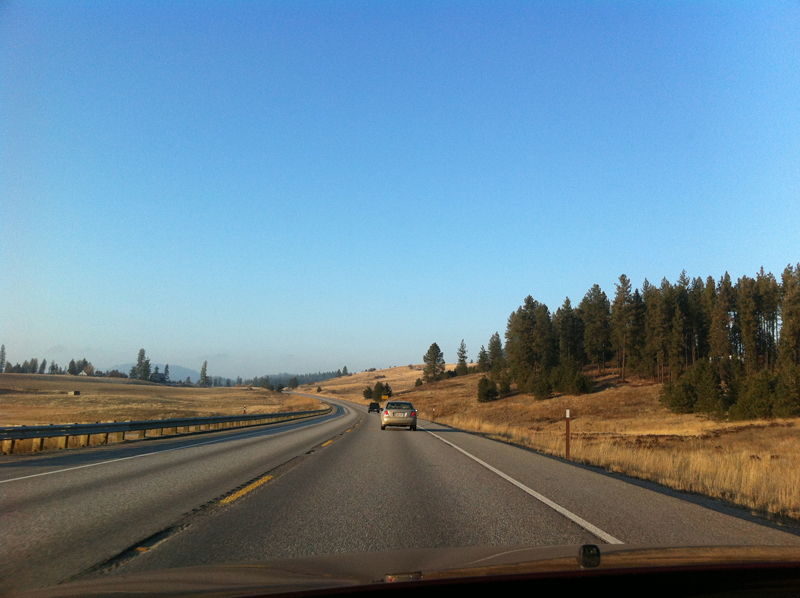 On the road, I found myself making good time to Kelowna. Despite the snow, the roads were dry the two cities outlying Silver Star — Vernon and the much-larger Kelowna. 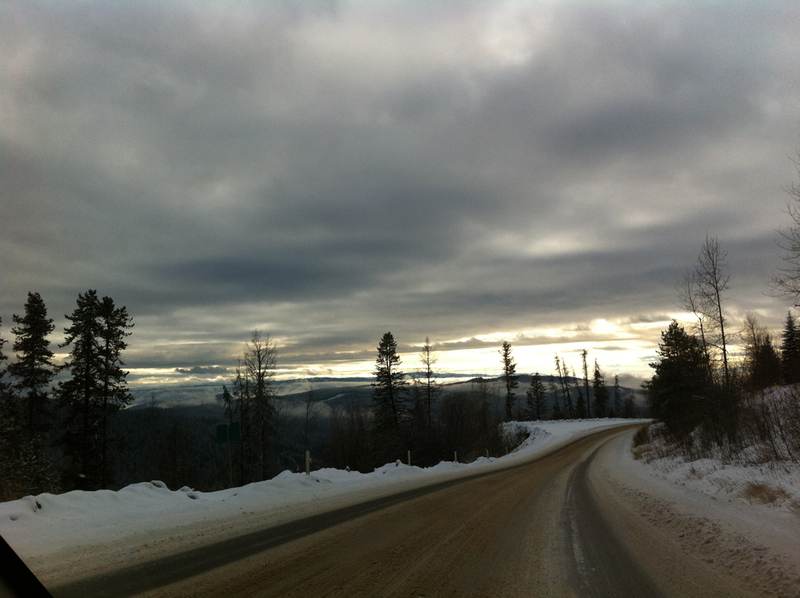 I was heading south, about five hours to Rossland, yet the drive involved me to go up into the mountains, away from the valley and its lakes and back into tough driving conditions. It wasn’t horrible, you just had to be alert. It was a good thing I was, too, considering I saw a moose and two deer right off the side of the road in about a half hour. A little spooky to see at dusk, but I pushed on. After a few hours, one of which I was stuck behind a large pickup going about half the the speed limit, I drove under the gate reading “Bonanza Pass.” Chains weren’t necessary, thank God, not sure what I would have done if they were. The road was decent, but as the incline increased, I wondered what was ahead of me. As it turned out, another pass. About 30 kilometers — 18.6 miles — from Rossland (where Red Mountain and the second set of NorAm XC races are), I trekked up Strawberry Pass. (Bonanza Pass was also called Blueberry-Paulson, so these two made a pair). 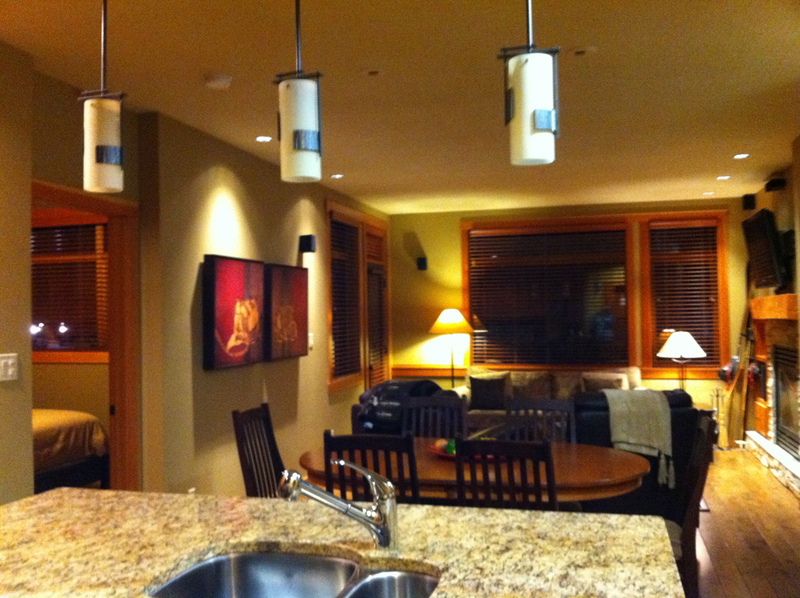 After a slow and careful drive, I pulled into Rossland only to find that I had arrived well beyond the check-in time. I called the number listed, and they gave me the access code to a lock box. Everything to that point had seemed like a little bit of an effort, yet from that moment on, it was gravy. In the lock box, I found my registration material — four keys, all of which let me into a heated garage. There, I had a designated spot, and one elevator ride later, I was a few steps away from my home for the weekend. 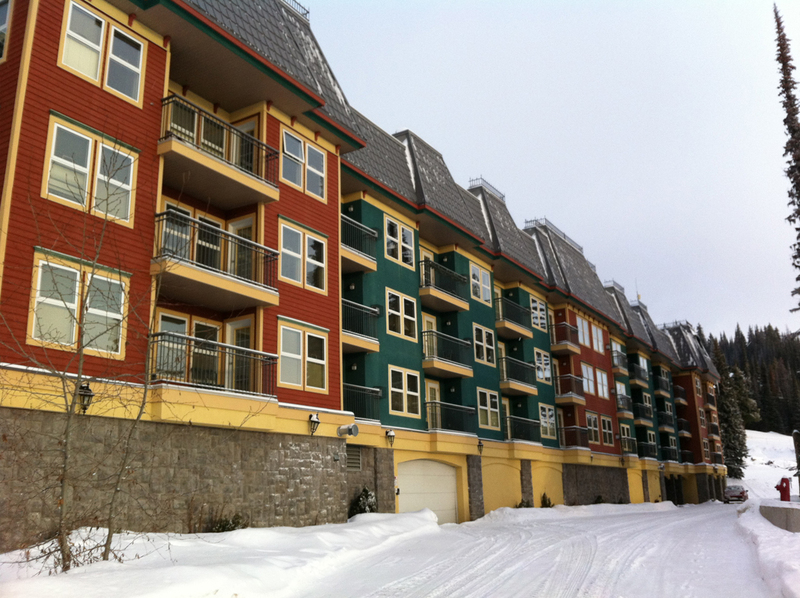 As I opened the door to the rented condo unit at Red Mountain Resort, I held my breath. I knew it would be nice — I had been told it was a two-bedroom unit (completely unnecessary, but nice!). With one swipe of the key card, I was in, and the place nearly made me cry. It was unlike anything I had ever seen before — like something straight out of a magazine. Aside from the two bedrooms and two bathrooms, there was granite kitchen, a big screen above a large fireplace and a private hot tub, accessible by either the living room or the master bedroom. My mind swirled. I was overwhelmed. The shower doubled as a sauna for crying out loud. Now lying on the couch with my feet up and a heated-up cookie at my side, I know how lucky I am. I’m just trying to figure out what I did to deserve it. A few minutes ago, I spilled chocolate on my shirt, and I’m not upset. Go figure. One of the greatest things about coming to the new place is the endless list of firsts. Everything’s new, everyday is an exploration and you never know what’s coming next. Since arriving in beautiful British Columbia four days ago, I haven’t stopped smiling. The people are nice, the experiences have been great and I feel so lucky to be here. I spent the greater part of the last three days working — with two 14-hour days of covering NorAm cross-country ski races this weekend and a Monday afternoon spent pouring over notes. But it’s still a vacation. In my first of two weekends covering races in western Canada, I’ve been able to meet new people — Canadians and Americans alike, whom I deeply respect for their commitment, talent and knowledge of the sport. 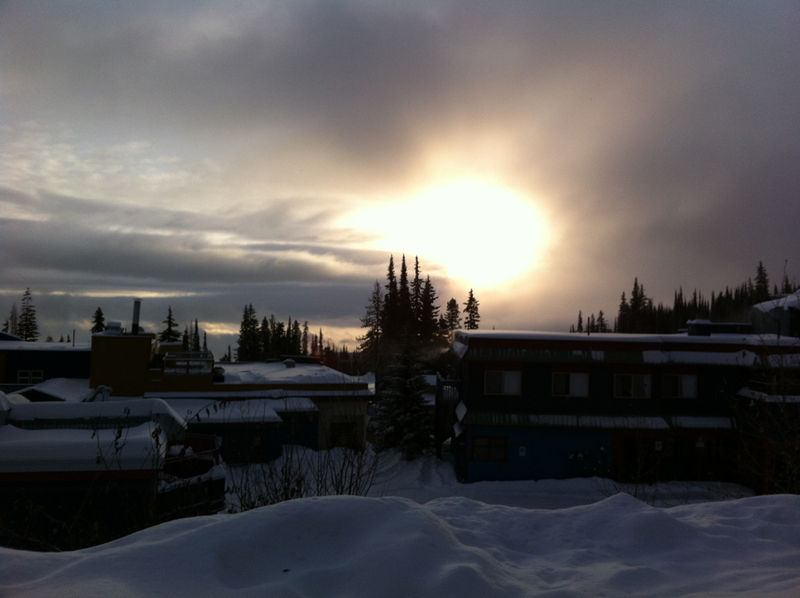 Aside from the skiers, I’ve had some neat encounters with locals in the village of Silver Star. Everyone I’ve met on this trip has been so friendly. It’s unbelievable how kindness snowballs and affects those who pass it on. (Part of it is that the Aussies are a big part of this town’s workforce. Their “no worries” attitude is contagious). 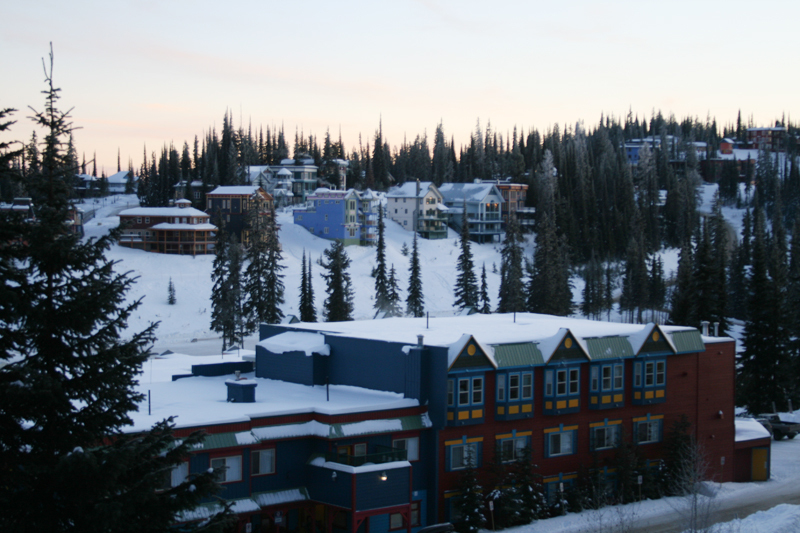 The view from my balcony at Silver Creek Lodge in Silver Star, B.C. One happy girl here! Before I rave about Silver Star — which I’ll likely do later once I spend more time here — I wanted to reflect on my trip up here. Throughout Friday’s travel, which included six hours of flights, three hours of layovers and seven hours of driving, I made a few notes of first impressions that struck me as funny. That’s one way to stay sane when you’re traveling for 16 hours alone. As we started our descent into Washington State, I finally drummed up the courage to talk to my seat mate. 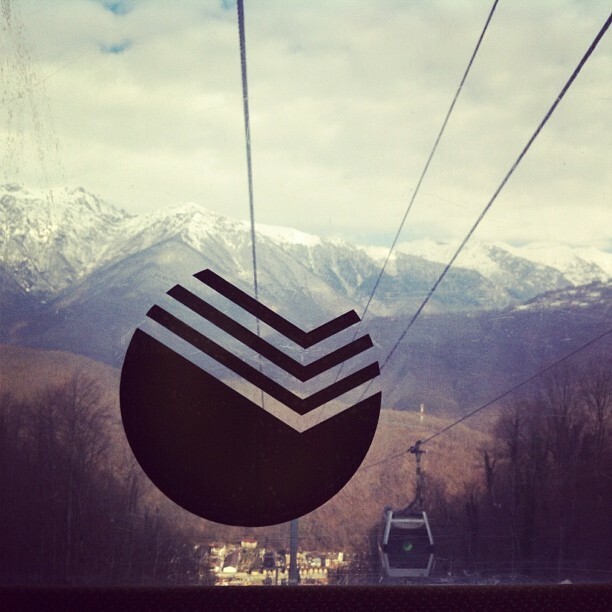 Do you know what ski mountain that is? He didn’t. Are you from this area? No. Then the man, who appeared in his 60s or so, must of realized I was trying. He started asking me what my deal was. He was a devoted sports fan of Michigan State and made the trip to watch its basketball team play Gonzaga. He had been there a couple times before. What’s Spokane like? He thought about his answer, and when he finally found words, it was something like, “Eh.” For someone from the Midwest, someone who joined the Topeka Ski Club just for the social aspect (he didn’t ski), I didn’t think that was saying much. I decided not to let his opinion sway me. As we touched down, out of the sun and into some foggy mess just above the ground, I saw what looked like snow. But no, the pancake-like landscape was covered in frost, and lots of it. A resident across the aisle — one who made me think I should’ve worn my cowboy boots — said he should’ve listened to his wife and moved back to Arizona. My seat mate wished me good luck, and I wished his team the same. “Don’t let the survivalists get you,” he said. Great, I thought. What the heck am I headed for? A few steps later in the manageable Spokane International airport, I was put at ease by a friendly woman behind the counter at Thrifty car rentals. As we wrapped up the conversation and she handed me the keys, she called me cute. Wow, I thought, people really are friendly out West. Even the border patrol officer was. He said he was jealous of my job. A few hours later, I finally succumbed to the fact that I needed to use a rest room. There had been plenty of opportunities to do so a few miles beyond the Canadian border, but I refused to stop. I was fine. By Kettle Valley, B.C., I couldn’t hold it anymore. As I ran into a gas station, a drawing on the glass door pointed me to the outdoor facilities. It was a picture of a smiling outhouse. Real funny, I thought. In reality, it was a portal potty. I would have rather gone in the happy outhouse. Unsure of where I was staying until about halfway through the drive, I inched closer, grew more tired, but kept my eyes on the prize. It didn’t matter where I was staying, as long as I could grab some decent grub and lay down as soon as I got there. I wheeled into Silver Star, a village about a mile high and accessible by a gnarly 15-mile access road. Luckily, the roads were dry, but Canada’s lack of guardrails kept me on my toes. At about 8:30 a.m. I parked the car and walked into what turned out to be an amazing lodge. My bosses had hooked me up with what was essentially a condo — with a kitchen, living area, queen bed, two bunk beds, fireplace and a balcony. This is too much, I thought. I dropped the bags and walked down a snowy path into the village. There were no cars, no plowed roads between buildings. You could walk or ski anywhere. 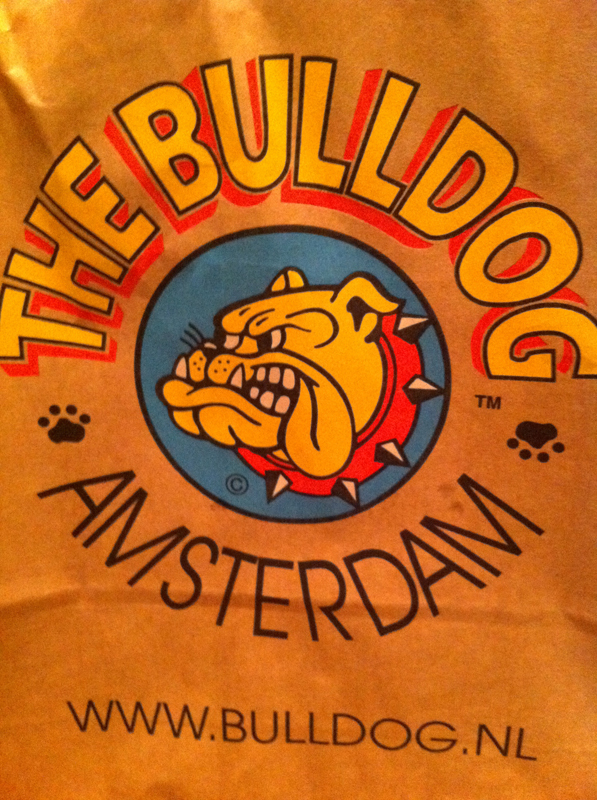 The place that called out to me had a huge cartoon bulldog as a sign. Yep, I thought about my lovable bullie, Charlie, and headed inside. I wasn’t going to have a beer (I was so dehydrated from the day), but I threw that out the window and sat down at the bar as I ordered chicken tenders to go. It was good! Pretty thick and sticky — like honey — but good. I found jam was the same way. In one of the favorite bakery/cafes in town, I grabbed breakfast two days later. It was in the 6 a.m. range, I had just gone out for a run in the dark (and straight up a seemingly endless hill, by accident), and I needed some coffee. I wasn’t sure what would be open but this place, Bugaboos, was. The owner smiled as I walked in the door. They didn’t have a ton of baked goods on display, so I grabbed a menu. Do you have scones? Let me look out back, he replied. They did. He asked me if I wanted butter and jam. No… (why would I need both?). Well, as I discovered, because Canadian jam is sticky. Really sticky. I asked Mr. Bugaboos owner when they opened each morning. “7:30.” I was there nearly an hour before. I apologized for walking in and ordering, but the man assured me it was fine. “I was here at 5 o’clock,” he said. That set the tone for the weekend. Everyone was accommodating from the staff and officials at the Sovereign Lake Nordic Centre to the wait staff in town. This was going to be a good trip, I thought. It had been one already. I celebrated my 25th birthday Sunday night with a couple drinks and a long night of writing, but it was fine. 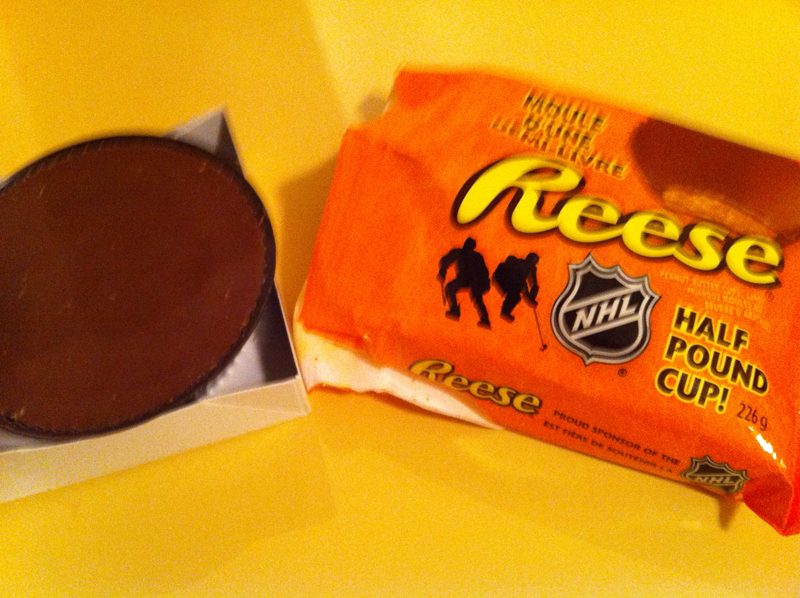 I curled up with a heated-up peanut butter cup, the biggest I’d ever seen: a half-pound Reeses. Silver Star and peanut butter = Heaven. Best birthday treat, a 1/2-lb peanut butter cup! Oh, Canada.